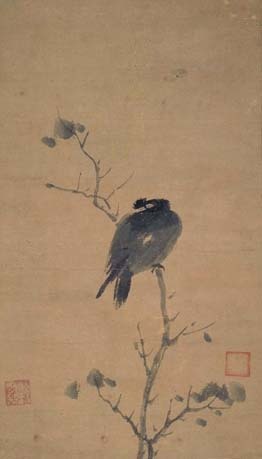 A myna bird is perched on a small branch with just a few leaves. Its relaxing pose with its neck turned is depicted by simple, swift strokes and the stillness is strictly expressed only through the shading of the monochrome ink. At the bottom right, there is a chop “Tenzan” which was Yoshimitsu’s pseudonym, indicating that this was a treasure of the Ashikaga Shogunate.